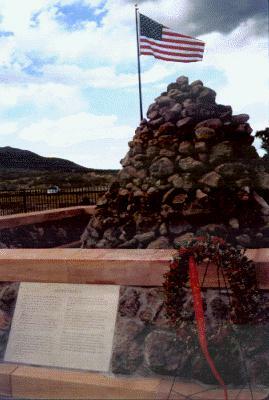 1857: The Arkansas Emigrants buried the bodies of ten men killed during the five-day siege somewhere within the circled wagons of the encampment located west of the current (1999) monument in the valley. 1932: The Utah Trails and Landmarks Association built a protective stone wall around the 1859 grave site in September 1932, and installed a BRONZE MARKER. This Association’s president was George Albert Smith of the Quorum of the Twelve Apostles and later President of The Church of Jesus Christ of Latter-day Saints. 1999: Under the direction of President Gordon B. Hinckley and with the cooperation of the Mountain Meadows Association and others, The Church of Jesus Christ of Latter Day Saints replaced the 1932 wall and installed the present Grave Site Memorial. "In the course of preparing to put that new monument there, we made every effort in the [Mountain Meadows] Association to discover where the remains were because we knew that cairn had migrated a bit over the years -- farmers had knocked it down, vandals had carried off rocks and so forth. Brigham Young ordered it knocked down once according to Dudley Leavitt, he was there with a party in the 1860s and they came up to it and he ordered it destroyed." On August 3rd, 1999, workers excavating for the wall around the new monument accidently uncovered the 1859 Carleton grave. On September 10th, 1999, the remains recovered from that grave were re-interred in a burial vault inside the new wall, along with some soil from Arkansas, during a private ceremony. The monument was dedicated the following day, September 11, 1999. The victims: The names of the Arkansas Emigrants who died on September 11th, 1857, along with the names of the children who survived and were returned to their relatives in 1859, are engraved on the 1990 Monument.